Shopping in bulk is better for the planet, as it reduces packaging and allows you to buy the amount you need, yet many bulk shoppers rely on plastic bags at the bulk bins. These bags are used either just to get the items home to jars or they are used to store the bulk goods in an annoying mess in cabinets. There is a solution! Made in the USA, reCap Mason Jars helps you control bulk food items while repurposing your mason jars. 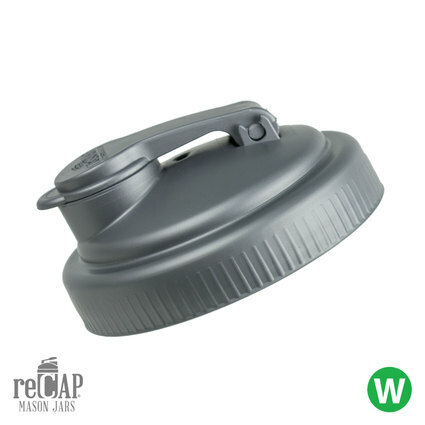 Perfect for wet or dry food (even string and hardware), [amazon_link id=”B00AYPU3B2″ target=”_blank” ]reCap mason jars[/amazon_link] are BPA free. They fit on standard regular or wide mouth jars, and have a flip lid. Like any Mom meeting a challenge, when I can’t find what I need, I make it. I set out to develop the perfect Mason Jar pour cap. My main priorities were to create a product that was safe to use, eco-friendly, able to be manufactured in the United States, and, of course, multi-purpose. This is perfect for kids! My son usually pours out too much when we use a standard mason jar lid, especially when it is sugar! This lids allow you to pour out small amounts. They are useful for just about anything. From salad dressing to smoothies, they can be used for more than just bulk food storage. Now we just have to remember to take our mason jars to the store and avoid the bulk bin plastic bag mess. « Natural beauty: Rose & Chamomile EO bath, shower, bubbles! Eco-Mom Confessions: Are Violent Polyester Halloween Costumes OK? Is watching TV shortening your life?